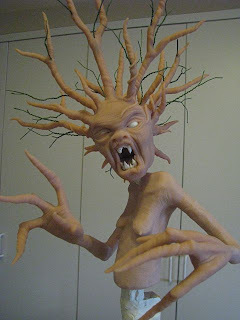 Ok....I said I was going to make something evil, so here are some wip photos of 'nasty tree lady'. The quality of the shots is not great as I've been working in the kitchen (again) to be around my family for the holidays. I'm quite pleased with how she's progressing, but I have to build her in sections as she's too tall for the oven, so anything could go wrong at any time. The menacing trees in 'Snow White' had a huge impact on me when I saw that film as a child......years later Brian Froud and Alan Lee talked about willow trees uprooting themselves at night to creep behind people as they walked home alone. My most beloved book as a very young child was "The Magic Faraway Tree"......my favorite part being when the children jump the ditch into the enchanted wood and hear the trees whispering to each other, 'wisha, wisha, wisha.' My sister and I spent wonderful days playing on and around the huge roots of the Morton Bay Fig trees in Botanic park during school holidays.....we were also lucky enough to have trees that we could climb in our own (very unkempt and therefore magical) backyard. So trees have had an impact on me.....most of it positive but I've always felt the possibility of a more sinister aspect. Hence,'nasty tree lady'. And, I have to say, I just love this darker aspect of Faerie.....there will be more! I also received something wonderful in the post today.....two stunning postcards from my lovely friend Koldo Barroso. Koldo produces some of the most beautiful, imaginative and sensitive illustrations I have ever encountered.....and what was particularly delightful about receiving these today was that one of the cards is an illustration called "The Homesick Willow"......trees again! If you haven't already seen this extraordinary artist's work, check it out HERE. He is also in my favorite blogs and sites list. I would just like to say thankyou to everyone who has commented, followed or e-mailed me with support and encouragement re this new blog. I read everything and do my best to answer all correspondence.....sometimes it takes a while, but I get there eventually. 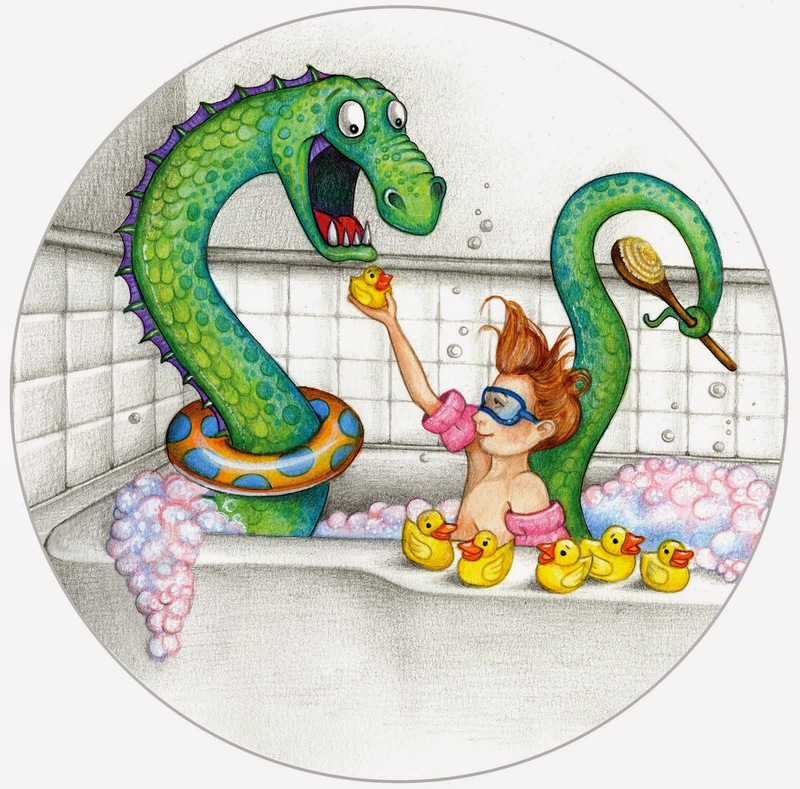 I'm still working towards a major overhaul for my website as well as designing new cards, bookmarks etc. I have to be careful that 'computer time' doesn't eat too much into 'sculpting time'.....so easy to do.....I love reading other people's blogs and checking out their work. If only I didn't need to sleep! Ooooh wow I already love your nasty tree lady!!! Your tree is something else! I love where you got all your ideas! 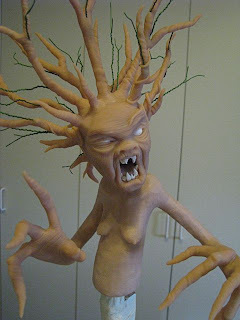 I can hardly wait to see what she becomes.. are you using polymer clay? I have 3 of Koldo's prints... one of the weeping willow. I just need to find time and $$$ to frame them! I love his work. Thankyou Lydia.....love your work too! 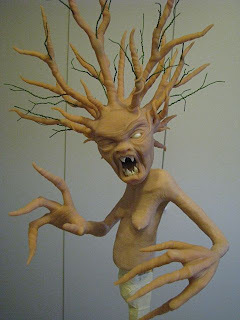 Pattee - Thankyou, ideas are leaking out of my ears at the moment....yes, she is polymer clay....lots of polymer clay! Just awesome and oh so scary. I too love trees and they have inspired many paintings and drawings for me. I can't wait to see her finished. Very reminiscent of the trees in the Wizard of Oz movie in feeling. I am impressed and speechless. This is an excellent work. Really great. WOW!!! I love this guy!! !